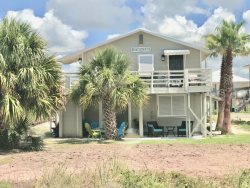 3BR/2.5BA located in historic Perdido Beach, AL. Water access with boat launch and pier! If you are looking for a quiet, out of the way place to relax, Soldiers Creek Retreat is the place for you. The town of Perdido Beach is within 20-30 minutes by car to Gulf Shores and Pensacola, OWA (big water) amusement park, and Foley, Alabama’s new soccer complex. By water you are minutes away from the Intracoastal waterway, Perdido Bay as well as Pensacola Bay. Soldiers Creek Retreat has water access and a shared boat launch within walking distance. This property is a 3 bedroom, 2 ½ bath with open concept for living and dining. The master suite has a large sitting area with sofa and chairs and is separated from the other 2 bedrooms by the kitchen, dining and living space. The other two bedrooms and bath have a door between the living quarters making the home a nice place for a shared vacation with friends and family. There is also a sleeper sofa in the living room for additional guests. There is a large screened in porch with built in grill, sink and a wood burning fireplace for those wonderful cool evenings.